One of Jesus Christ’s titles is the Good Shepherd. He wants us, His lambs, to be happy and have the blessings of His gospel. 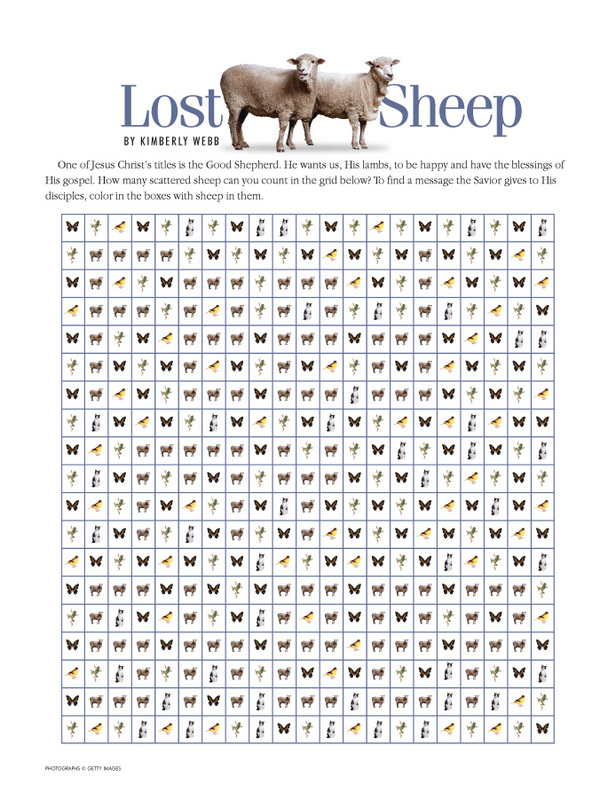 How many scattered sheep can you count in the grid below? To find a message the Savior gives to His disciples, color in the boxes with sheep in them. Little Lamb, I’ll tell thee. Ever since my Primary teacher gave each of us a picture of the Good Shepherd, I’ve wanted to be a real shepherd with a lamb of my own. I tacked my picture on the wall by my bed in the loft so that I could look at it by lamplight and think about how it would be and remember to mention it in my prayers. With leftover chicken wire, I built a sheep pen that I could move from grass spot to grass spot by myself. And I found an old baby bottle that I could use to feed my future lamb until it learned to eat grass. But being all ready to be a shepherd made the waiting to get one that much harder. The day I sighted the dust drifting across the flat brushland below our farm, I figured that my prayers were going to be answered. I threw a saddle on Old Blue and grabbed the two grain sacks that I’d been saving. “Mama, Woody is moving his sheep!” I yelled. Lambing time was over, and Woody Morehouse was moving his sheep herd to the mountains, as he did every spring. He always moved them across the flat and up a nearby canyon to feed during the summer. Sometimes a newborn lamb would be too weak to keep up with the ewes and would be left behind in the brush. Woody usually gave these orphan lambs to the first one there to speak for them. This year I was going to be the first. Blackie could sniff out any lambs left behind. He yipped and barked alongside Old Blue. Woody rode up, knowing why I had come. “Maybe next year, Amos,” he told me. Swallowing against the tightness in my throat, I whirled Old Blue toward the farm before I started crying right in front of them. When I heard Tim pounding up behind me on his brown mare, I swiped quickly at my eyes. I glared at Tim. “How do you know you’ll find any?” I asked. And I secretly hoped that there wouldn’t be any. I wanted to kick Old Blue and ride away from the sight of Tim’s grinning. But Tim was my friend, and he didn’t know how much I longed for a lamb. I held out my grain sacks. “I know how to do it,” Tim said. Then he whooped and whirled his horse and galloped back toward the sheep trail. I could smell the warm biscuits when I rode into our yard, but I hoped Mama hadn’t noticed me ride up. I just wanted to slip up the outside stairs to my loft bedroom. The picture of the Good Shepherd looked down at me as I lay on my bed. The lamb in the Shepherd’s arms looked soft and woolly and contented. My lamb would have been like that, I thought. And it would have nuzzled my face and followed me, just like Blackie. I turned over and buried my face in the pillow, wondering how Tim could have prayed any harder than I had. My eyes widened, and my heart leaped, and the singing inside me began all over again. “If it’s alive, my dog, Blackie, can find it!” I declared. I was almost to the corral before I remembered to tell Ma. I had ridden Old Blue halfway up the canyon with Blackie at his heels when I saw the cougar tracks. Right where the trail crisscrossed the little canyon stream, the cougar had left tracks in the wet sand! Old Blue sensed that a cougar was near. He didn’t much like going up the trail, especially when it narrowed and sheer cliff walls hemmed it in. After Old Blue settled down, I sent Blackie on ahead to sniff out any danger. Blackie found the ewe’s carcass, and when I rode up, I saw that that old cougar had torn off a whole hind quarter and packed it away. Little chills crept along my neck. I had to think about the picture back in my bedroom to keep from hightailing it back down the canyon. I didn’t want to meet up with any old cougar! “Find the lamb, Blackie,” I said softly. And Blackie set off through the rocks and brush. I rode Old Blue slowly along behind Blackie. And I prayed. I never wanted anything so much as I wanted that little lamb to still be alive. Just as the trail left the cliff walls and opened out onto an old rockslide, I heard Blackie bark. I got a glimpse of something woolly and cream-colored breaking out of the brush and running toward the rocks. I could have hugged that old dog when I saw that he’d driven the lamb into a niche between two big rocks and was just standing there, blocking its escape and wagging his tail. Right then I loved that dog more than I ever had before. The lamb struggled and began to bleat. Its little sides heaved in and out, and there was wild fear in its eyes. I reached into the niche and pulled it out. It struggled to get out of my arms, and I wondered, What did Jesus do when He found His lost lamb? How did He calm His lost lamb’s pounding heart? I walked Old Blue to a big rock so that I could hang on to my lamb and still climb into the saddle. Blackie ran ahead on the trail, stopping to sniff at the carcass of the dead ewe. It choked me some when I passed it, thinking about how my lamb had stayed close by, fearing to move yet fearing to stay. Old Blue seemed anxious to get down out of the canyon, so I let him lope past the sheer cliff walls, past the tracks in the wet sand. And all the time I had my arm tightly about the little woolly body, hoping that it could tell how I meant to care for it. And how I meant to be a real shepherd. If a lamb is lost, a good shepherd finds it and brings it back to the fold. Jesus Christ is our Good Shepherd because He rescues us when we are lost. Before playing the Good Shepherd Game, glue this page to poster board and let the glue dry. Color each lamb a different color or a different pattern of colors. Then cut out the lambs. Play the game in family home evening by hiding a lamb and letting a member of the family find it. If you wish, you can bleat “baa” louder or softer as he or she gets closer to or farther from the lost lamb. Let everyone have a turn being the shepherd. Or each family member can take turns finding all nine lambs. You can play another game called Please Don’t Eat Shawna the Sheep. 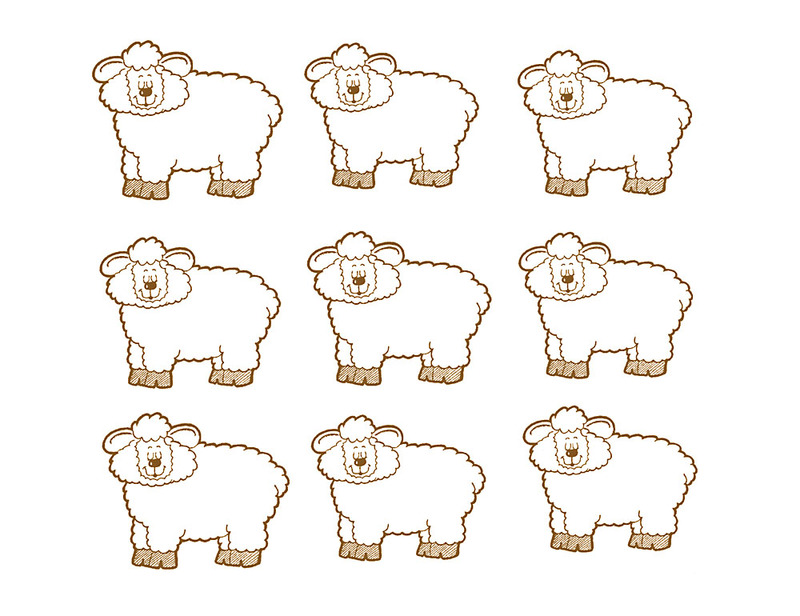 Lay the sheep on a flat surface. Then place a small candy on each sheep. One family member leaves the room while everyone else chooses one sheep to be Shawna. The person comes back and begins to eat the candies one at a time. When the person tries to eat Shawna, everyone yells, “Don’t eat Shawna!” That person’s turn is over. Replace the eaten candies and let someone else have a turn. In the time of Jesus and in earlier Bible times, shepherds tended flocks of sheep that provided both food and clothing for their families. Shepherds were some of the first people to hear about the birth of the Baby Jesus. Shepherds loved their sheep and took good care of them. They spent day and night with their sheep to protect them from wild animals and dangerous places that might harm them. And they led their flocks to good food and clear water. If the flock were not too large, shepherds often gave each a name. The shepherd of Bible times would lead his sheep rather than drive them as the western shepherds do. Every evening he counted his flock as he put each sheep into the fold (enclosure to protect animals). Sometimes the fold was called a corral. The older boys in a family would help the father plow, sow, and harvest the grain. But when the youngest boy was old enough, he was chosen to become a shepherd who cared for the family’s sheep. Shepherd boys lived very simple lives and wore simple clothing. They wore a tunic like a long shirt made of cotton, with a leather girdle or belt wrapped around the waist. An outer garment consisted of a warm aba, often made of camel hair. It shed rain and at night could be used as a blanket. The shepherd carried a scrip, a bag made of dried skin or homespun material. When he left home to tend his sheep, his scrip was filled with bread, cheese, dried fruit, and perhaps some olives. And for protection from wild animals, a shepherd also carried a rod, a stout wooden club similar to a policeman’s truncheon. It was often made of oak and had a knob on the end of it. Sometimes spikes were driven into the end of the rod for added protection. A shepherd often used a staff to help him guide his sheep. Sometimes the staff had a crook on the end that enabled the shepherd to hook any sheep that began to wander from the flock. He also used a sling made of two strings of sinew, rope, or leather, with a wider piece of leather in the middle to hold a stone. The sling was swung around the head, and the stone was released by letting loose of one end of the string. It was used to protect the sheep from wild animals or to alert the flock to change its direction of travel. Occasionally the shepherd used the sling to drop a stone close to a sheep that might be lagging behind or to startle a sheep that needed to catch up with the flock. Jesus was often referred to as the Good Shepherd. His followers were people who believed in Him, and were sometimes called His sheep or His disciples. Before He left them, He made sure that each one of His sheep or followers was loved and cared for. Jesus needed someone to feed His sheep, that is, to teach and care for them and to be their shepherd when He was no longer with them. He asked His disciples who loved Him to do this. Jesus knows and loves each one of us. He wants us to know that we are precious in His sight. He is concerned about us and wants us to learn about Him and His gospel and to return and live with Him some day. We must also help to watch over all of Jesus’ sheep. By doing those things that we know are right and by sharing with others the truths of the Church, we are helping to feed His sheep. Color the flannel-board figures, then mount them on heavy paper. 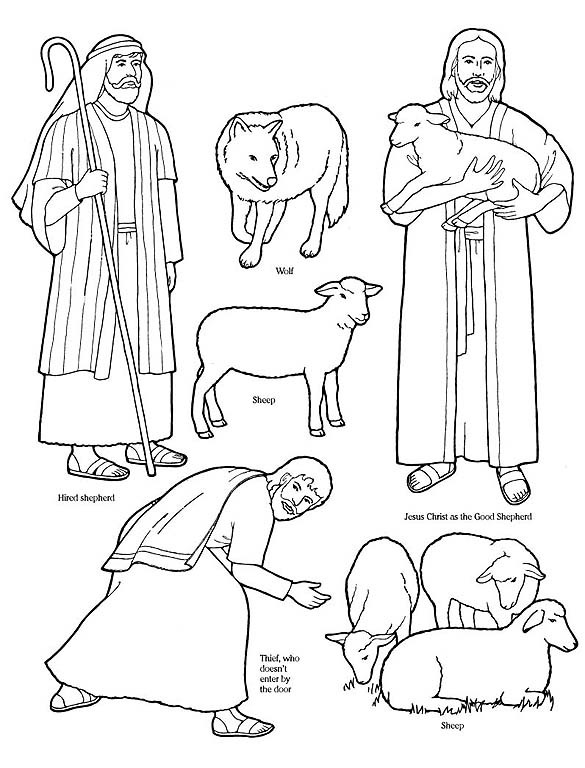 Cut them out and use them to retell the story of the Good Shepherd. If ye have faith ye hope for things which are not seen, which are true (Alma 32:21). Sometimes when Jesus Christ taught, He used stories. One of the Savior’s stories was that of the Good Shepherd. He taught that a good shepherd does not sneak into the sheepfold, but goes in through the door. He “goeth before [his sheep], and the sheep follow him: for they know his voice” (John 10:4). “He that entereth not by the door into the sheepfold, but climbeth up some other way, the same is a thief and a robber” (John 10:1). A hired shepherd—a sheepherder—rarely loves the sheep he watches as much as a good shepherd does. If a wolf attacks the flock, a sheepherder may run away to save his own life, leaving the wolf to scatter and kill the sheep. A good shepherd owns his sheep. They are his, and he takes care of them. He will do anything necessary to protect his sheep, even die for them. Jesus Christ is the Good Shepherd. He suffered and died for us so that we could return to Heavenly Father. We are His sheep if we will listen to His voice and follow Him. We do this by keeping the commandments, studying the scriptures, and obeying the prophets and the promptings of the Holy Ghost. We may not actually see the Savior in this life. But if we have faith in Him and follow His voice, He will protect us and lead us in the correct paths.